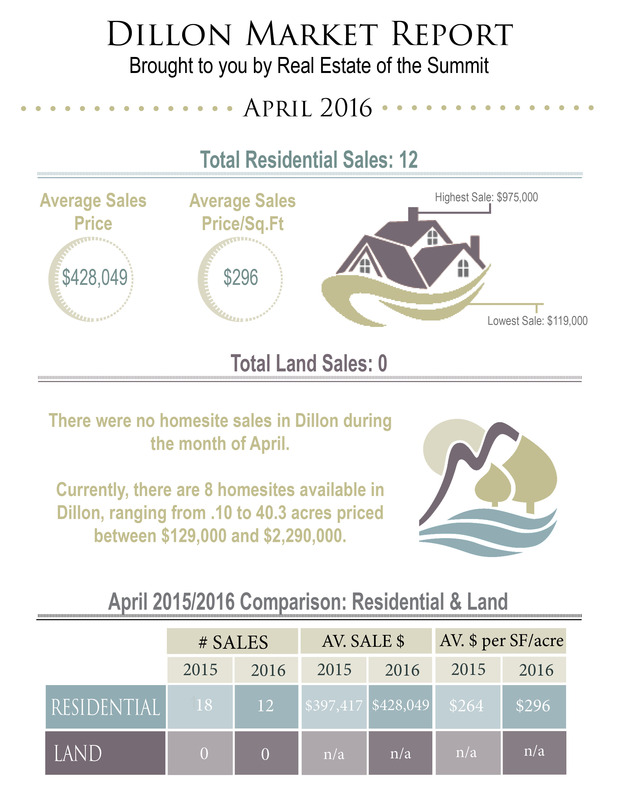 The Dillon Market Report is brought to you by the professional real estate team at Real Estate of the Summit! We research daily trends and market changes to deliver a visual representation of the market information each month. The diagram below represents monthly sales, average sale prices and year to date statistics. Comparing monthly changes has never been easier, as each monthly report is readily available in the Dillon Market Report Archive link at the bottom of the screen! The Town of Dillon is primarily made up of large homesites with immaculate homes, yet it is also home to some of the most affordable housing in all of Summit County. Conveniently located between 3 major ski areas, Dillon is also settled amongst premier shopping areas and restaurants. The real estate market in Dillon continues to gain momentum as more buyers are approaching the mountain market and inventory available continues to decrease. Make the most informed decision when investing or divesting in Summit County real estate by keeping track of the monthly trends. To compare past Dillon Market Reports, take a look at the Dillon Market Analysis page which contains market information from previous months and will help you to compare past reports – you can find a link to this page below. For even more information about what’s going on in Dillon feel free to contact one of our knowledgeable brokers at Real Estate of the Summit by calling our office at (970)453-1450. Click here for your in-depth Dillon Market Analysis!